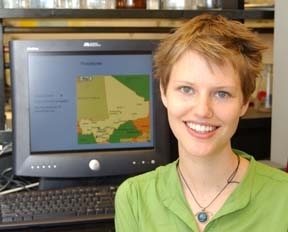 DAVIS--Two doctoral students studying mosquito-borne diseases at the University of California, Davis have received the 2007 William Hazeltine Student Research Fellowships, memorializing a California entomologist who managed mosquito abatement district programs in Butte and Lake counties. 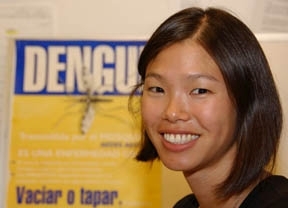 They are Lisa Reimer, who studies malaria with UC Davis medical entomologists Gregory Lanzaro and Anthony Cornel, and Jacklyn Wong, who studies dengue with UC Davis medical entomologist Thomas Scott. Each received $1350. Reimer is researching insecticide resistance of the malaria mosquito, Anopheles gambiae, while Wong is studying oviposition site selection in Aedes aegypti, the mosquito that transmits dengue. Reimer will work in the west African nation of Mali for the second consecutive summer, while Wong will do research in Iquitos, Peru this summer and next summer. The World Health Organization cites resistance to insecticides as one of the primary factors impeding malaria control efforts. Malaria kills more than a million people a year, and 90 percent of the global incidence of malaria occurs in Africa. Reimer’s interest in malaria sprang from her work as a science teacher with the Peace Corps in The Gambia, West Africa from 2000-2002. Reimer, from Kirkland, Wash., received her bachelor of science degree in biology from the University of Puget Sound, Tacoma, Wash., in 2000. She served as a research assistant at Princeton University and UC Davis before enrolling in the UC Davis doctoral program in 2005. “This information will be useful for predicting how Aedes aegypti will respond to targeted vector control measures that modify oviposition sites,” Wong said. Globally, some 2.5 million people are at risk for dengue. World Health Organization statistics show 50 million annual cases of dengue fever. The most severe form, dengue haemorrhagic fever, afflicts 100,000 people a year and is potentially lethal. Wong, from San Luis Obispo, received her bachelor’s degree in molecular and cell biology from UC Berkeley in 2001 and her master’s degree in epidemiology from UC Davis in 2006. She enrolled in the UC Davis entomology doctorate program in the fall of 2004. Hazeltine (1926-1994) managed the Butte County Mosquito Abatement District, Oroville, from 1966 to 1992. He was an ardent supporter of the judicious use of public health pesticides to protect public health, according to colleague Robert Washino, emeritus professor and former chair of the UC Davis Department of Entomology. Hazeltine studied entomology in the UC Berkeley graduate program from 1950 to 1953, receiving his doctorate in 1962 from Purdue University. He managed the Lake County Mosquito Abatement District from 1961-64 and the Butte County Mosquito Abatement District from 1966-1992. He continued work on related projects until his death in 1994.